The Toronto Telegram. January 30, 1967. 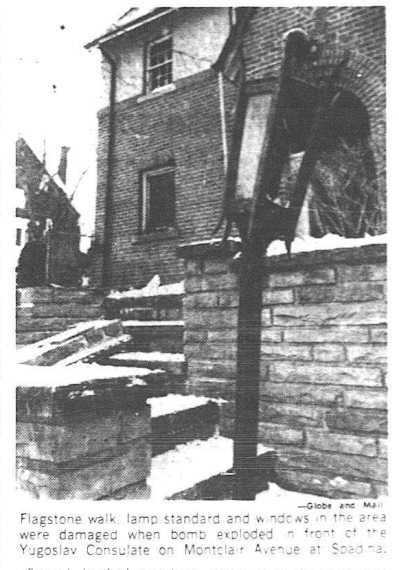 In the 1960s two bombs, 14 months apart, exploded outside the Yugoslavian Consulate at 377 Spadina Road. Although nobody was seriously injured in either blast, significant chunks of the building were destroyed, and hundreds of windows in the surrounding homes were shattered. For several years, the corner of Spadina and Montclair attracted considerable attention from Torontonians opposed to Josip Broz Tito‘s regime in Yugoslavia, and was a target for extreme protests. The years after the Second World War saw a considerable increase in the numbers of Yugoslavian immigrants in Toronto. Some were simply seeking work, as Tito’s policies drove up Yugoslavian unemployment during the 1950s. Others were directly opposed to his ideologies, or sought to advance nationalist causes. Although immigrants from all of Yugoslavia’s ethnic groups are known to have settled in Toronto during these years, the Croatians and Serbians appear to have been the most vocal in their opposition to Tito. The following year, a Yugoslavian Consulate is first seen in the city directories, initially located in an office building at the northeast corner of College and Spadina, where it shared the floor with two lawyers, an optometrist, four dentists, the Bureau of Jewish Education, and the Spadina Liberal Association. Later in 1954, the consulate relocated to a new building at the southeast corner of Spadina and Montclair. The neighbourhood was primarily residential, at what was then the northern boundary of the City of Toronto where it adjoined the village of Forest Hill. 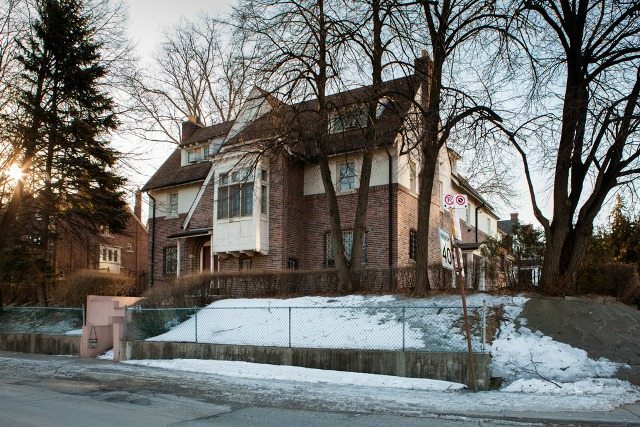 Although initially attracting little apparent interest in the press, the consulate would become the site of regular protests from both Serbian and Croatian Torontonians, and eventually the site of considerable violence. The consulate building as seen in March 2014. Photo by Harry Choi. 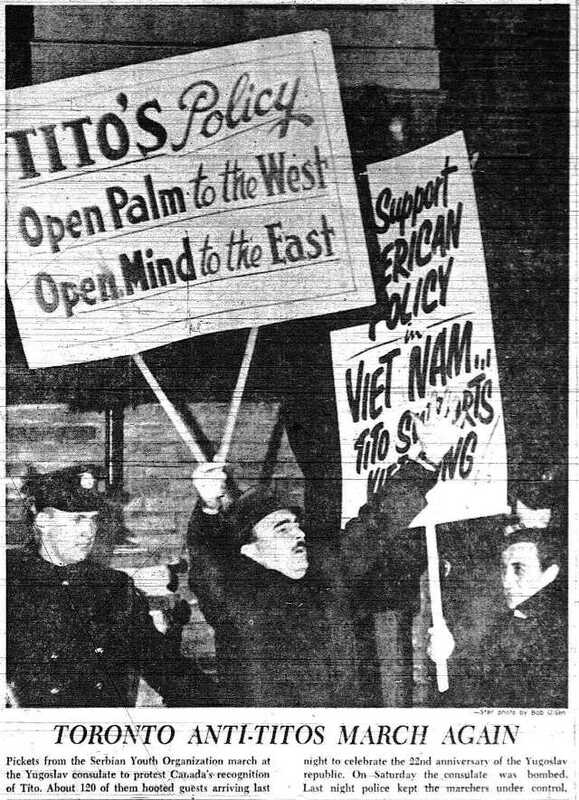 The first major anti-Tito protest reported in Toronto newspapers came in 1960, in anticipation of the upcoming Yugoslavian national holiday on November 29. As about 700 members of the Canadian Yugoslavian Cultural Organization celebrated at La Plaza Theatre on Queen Street East, 400 protestors who identified as Croatian and Macedonian protested outside. According to the Star, the protestors’ chanting soon devolved into egg-hurling and goading. “A small man from inside the theatre accepted a dare to step outside and was promptly kicked . . . Several times, spitting duels broke out between the marchers and men wearing red arm-bands.” Police broke up the demonstrators before it escalated into a full riot. Few subsequent anti-Tito incidents were reported in Toronto until the early morning of November 27, 1965, when a bomb exploded under the doorstep on the Montclair Avenue side of the consulate. John Guest, a 21 year-old University of Toronto student, was with friends six doors away when they heard the explosion. According to the Star “he and his friends ran to the building and managed to get in. They found the ground floor ‘a complete shambles, with glass and rubble everywhere. '” Once inside they found the occupants dazed, but otherwise all right. Consul general Bozidar Stanic (referred to in the Star as “the dapper little consul”) emerged unharmed from upstairs, along with the chief secretary Alexander Makevic, and both their wives and their children. The Toronto Star. November 30, 1965. According to the Globe and Mail, “the explosion destroyed the door, door jamb, cement threshold, and foyer ceiling, and heavily damaged a vestibule and anteroom.” The door and windows were blown out, and part of the first floor ceiling collapsed. Damage was not limited to the consulate itself. The Star reported that force of the explosion destroyed 100 windows in neighbouring homes. Chief of police James Mackey was quoted in the Telegram as calling the attack “a vicious type of bombing,” and ordered an investigation to work on the case around the clock. A police guard was established outside the consulate, and fragments of debris were sent for laboratory analysis. Two days later the 1965 annual Yugoslavian national day celebrations took place, this time at the New Yorker Theatre. They were protested by a group denouncing Tito, accusing him of committing genocide against Croatians. With anti-Tito activists suspected of the earlier bombing, one protestor outside the theatre said that “Tito supporters probably had set the bomb themselves to make propaganda.” Despite tensions, protests were evidently orderly that year. 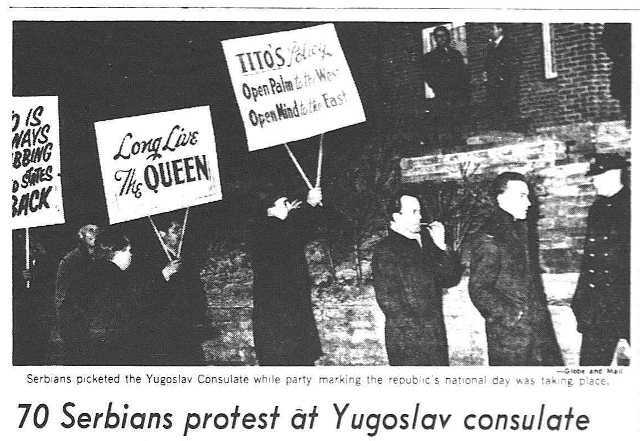 The same night, a group of about 120 members of the Serbian Youth Organization peacefully protested Tito’s policies outside the consulate itself. The Globe and Mail. November 30, 1965. The Toronto media clearly had a difficult time understanding the communities and local political organizations connected to Yugoslavia and its peoples. Some articles referred to protestors as “anti-communist” or “anti-Titoist,” while others identified protestors along ethnic lines. Others simply referred to the people as “Yugoslav.” Following the 1965 bombing, the Star noted that “Toronto’s Yugoslavian community is split along national, religious, and political lines—with the same persons often allied in one grouping and opposed in others.” Few specific cultural organizations were ever mentioned by name, making it difficult to identify the root behind many of the protests. Dissent persisted. The following autumn, an unexploded bomb was found outside the consulate, prompting the temporary reinstatement of the round-the-clock police guard. The guard was removed near the end of 1966. Three weeks later, near-simultaneous bombs exploded at Yugoslavian targets in six North American cities, including the consulate in Toronto. In the early morning of January 29, 1967, bombs exploded at the Yugoslavian embassies in Ottawa and Washington, and also at the consulates in Toronto, Chicago, New York, and San Francisco. The bombings took place on the eve of the anniversary of the adoption of Yugoslavia’s constitution. 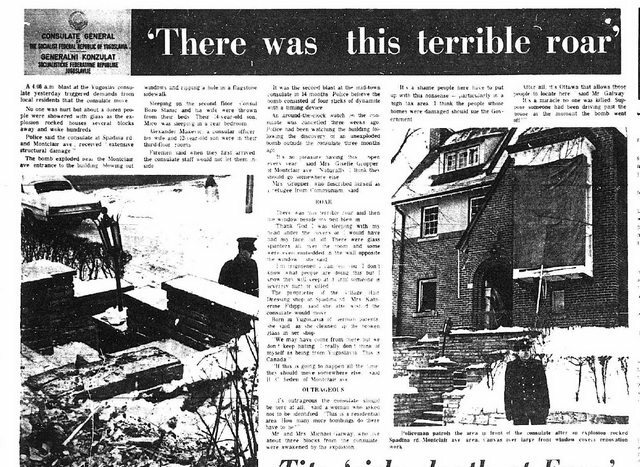 The Toronto bomb, believed to have been between four and 10 sticks of dynamite, was again placed near the door of the Montclair entrance, causing a loud explosion which reportedly woke residents several blocks away. Set at the top of the stairs, slightly away from the building this time, it tore a metre-long hole in the flagstone walkway. The explosion threw Bozidar Stanic and his wife from their beds and caused extensive damage to the building, but once again no people were killed. By this time, many of the nearby residents were uncomfortable living near a building which had clearly established itself as a political and terrorist target. Several locals told the press that they wanted the consulate to relocate, and the Globe and Mail reported that locals were circulating a petition for this purpose. An unidentified woman told the Telegram “It’s outrageous [that] the consulate should be here at all. This is a residential area. How many more bombings do there have to be?” While the federal government agreed to pay for the costs of property damage to the consulate, it dragged its heels in agreeing to cover repair costs to the surrounding properties, infuriating the residents and increasing the calls for its relocation. The following year, the protest was called off. Local police established a presence in front of the consulate on November 29, prompting memories of the previous year when one protestor fell in front of a horse and was nearly trampled on. The Star quoted William Durovic of the Serbian Anti-Communist Front (and Progressive Conservative candidate for York Centre in 1963) as saying, “They had no reason last year for turning the horses on us and we have old women and children who might be hurt if they charged again.” Instead, the protestors remained at St. Michael the Archangel Church on Delaware Avenue, where they reportedly “sipped slivovits [sic], a fiery plum brandy which is Yugoslavia’s national drink.” A Croatian protest the same night was apparently not deterred, and proceeded without reported violence. Although protests continued through most of the 1970s, the consulate escaped further attacks. In 1971, arrests were made in November during a Croatian protest, after eggs were thrown at the consulate. The following year, Croatians staged a mock funeral procession outside the consulate, reportedly culminating in the destruction of a casket marked “Yugoslavia.” In 1977, three Serbians were killed in a mysterious west-end explosion, leading to newspaper speculation that the victims might have been linked to anti-Tito extremism and killed by a bomb they were constructing, although no evidence emerged to verify this explanation. Following the 1977 explosion, the Star wrote that “Stephen Miosich, publisher of a weekly newspaper for Metro’s Yugoslav community, said political violence by extremist Serbian and Croatian groups in southern Ontario peaked several years ago.” This appears to have been accurate, as reports of protests dwindle after this time. The few that were reported later were generally peaceful until the late 1980s, when Yugoslavia began dissolving as a state. Additional material from: Stephen Clissold, Croat Separatism: Nationalism, Dissidence, and Terrorism (Institute for the Study of Conflict, 1979: London); the Globe and Mail (November 29, November 30, 1965; January 30, January 31, February 4, February 28, 1967; November 29, 1968; November 29, 1971; September 2, 1977); Polyphony: Toronto’s People / The Bulletin of the Multicultural History Society of Toronto (Spring/Summer 1984, Vol. 6, No. 1); Jeffrey Ian Ross, Violence in Canada: Sociopolitical Perspectives (Oxford UP, 1995: Toronto); the Toronto Star (November 4, 1953; March 21, 1960; November 28, 1961; November 27, November 30, 1965; January 30, January 31, February 1, February 4, February 27, September 15, November 30, 1967; November 29, November 30, 1968; October 6, 1970; November 29, 1971; December 4, 1972; September 1, 1977; April 25, 1982; February 23, 1987; May 25, May 26, 1992); The Telegram (November 27, November 29, 1965; January 30, January 31, 1967).